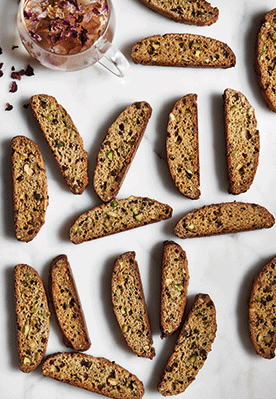 ‘Biscotti’ means twice cooked, and these biscuits are literally cooked twice, so they can be stored for longer. These morsels of nutty, chocolatey goodness are a good source of protein, making them the perfect satiating snack. 1. Preheat the oven to 180°C (350°F). Lightly grease and line a large baking tray (cookie sheet) with baking paper. 2. Beat the eggs, maple syrup, coconut oil and lemon zest together in a medium bowl, until combined. In a separate bowl place the almond meal, millet flour, arrowroot, chia seeds, baking powder and salt and mix well. 3. Add the dry ingredients to the wet and mix well to combine. Add the pistachios and cacao nibs and mix to distribute evenly. Set aside for 10 minutes, to allow the chia seeds to hydrate slightly. 4. Spoon the mixture down the centre of the prepared tray. Using damp hands, shape the dough into a 30cm (12 in) long × 8 cm (3¼ in) wide, flattish log. Bake for 35 minutes, or until firm and golden brown. 5. Remove from the oven and set aside until cooled enough to handle, approximately 10–15 minutes. Decrease the oven temperature to 150°C (300°F). Using a serrated knife, trim the ends of the log. Cut into 18 × 1.5 cm (7 in × ½ in) thick slices. Arrange, cut-side down, on the baking tray. 6. Return to the oven and bake for a further 15 minutes on each side, or until crisp, dried out and golden brown. Remove from the oven and set aside to cool completely. NOTE: These can be stored in an airtight container for up to two weeks.